London Fashion Week is over, finishing yesterday, this will be my 5th day review on the last LFW looks! Fashion East rocked the catwalk, with unique designers, textures and colours it was bound to be a winner. I love the cool design on the dress below as it is very artistic and 'art deco' looking. I also love the colour choices shown in the whole collection, from yellows, greens, light pinks too blacks and simple whites created the much needed summer vibe. The show finished with 'H', which seemed a pretty good way to end fashion week. 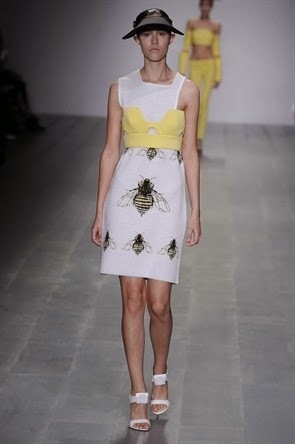 I love the dress below, I think it's so edgy with the bold bumble bee print on front however it defiantly represents summer! I also love the sharp dresses (2nd and 3rd) below with an interesting hem line, cut outs and simple colours. I did dislike the space ship hats though featured in the last two pictures seen here, I think it drew attention away from the lovely dresses. It was a very simple but classy collection. 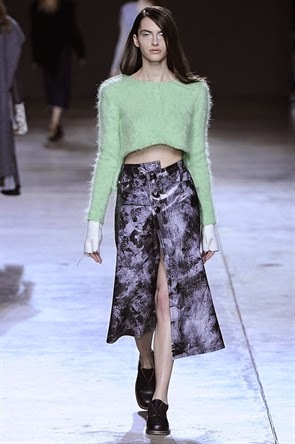 Mainly featuring bold, block colours such as green, black and white gave the collection a realistic feel. 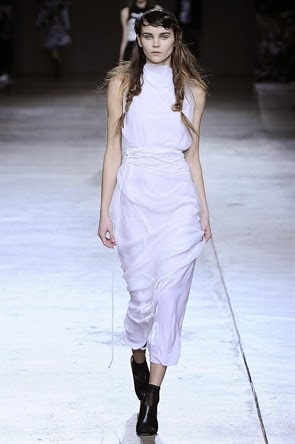 I love the choppy hem line on the dress below and how its a twist on the classic 'high-low' style. Also the bags a beautiful and I would defiantly be wanting to purchase the black leather in the second picture if I had the money! Simone's collection was very basic, showing lots of monochrome. However he wowed with the amount of detail each piece had whether it was lace like the dress below or a fur trim on the trouser leg in the second photo. 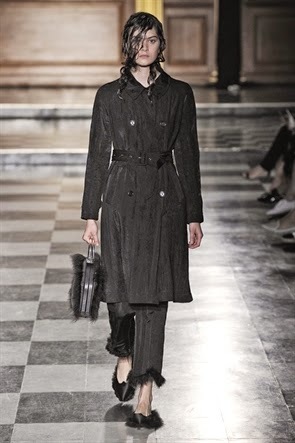 Although I would like to have seen a different hair style, as I personally thought it was a bit sloppy, I loved the simplicity of the collection and damn that trench coat, second below, is heavenly! Anya's bag wowed me and I'm sure a lot of others. Although some of her designers where slightly daring and koo koo, I love the three below. Firstly the green one below is so fun- loving with a cute smiley face which is very subtle to the huge key change. I also loved the second bag from the choice of colours as she used colour blocking which adds to the outfit worn. 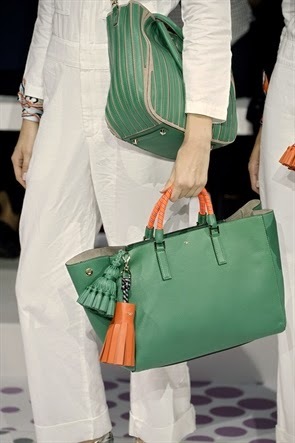 Lastly the third bag I loved the colour also as its very spring like alongside the vibrant orange. That's all from London Fashion Week! What was your favorite collection?